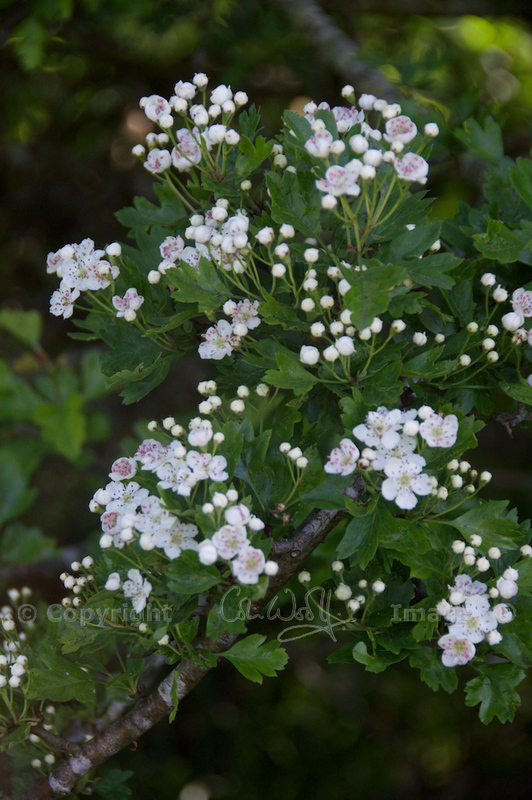 In my series on British trees I’ve arrived at the beautiful Queen of the May – the hawthorn. Quickthorn, whitethorn, hagthorn, mayflower; in Welsh, the hawthorn is known as Bara Caws (‘bread and cheese’), because that’s what the leaves are said to taste like. But there are even more traditions connected with the hawthorn than there are names, because this tree has a very special place in our affections and our folklore. Traditionally, on the night before the first of May, the young people of a village would head off into the woodlands and reappear at dawn, their arms laden with boughs of hawthorn blossom. This night-time quest hid another motive, however, which was to indulge in some outdoor love-making, and many babies were conceived around this time! 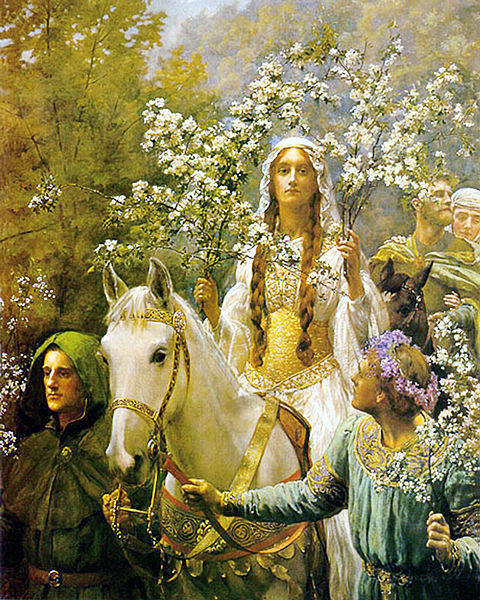 Symbolically, the May Queen was united with the Green Man, at the time when the Earth was at its most potent and fertile; whether the festival was called May Day, Beltane, or Calan Mai (in Wales), the essential meaning was pretty much the same. While hawthorn was woven into wreaths and garlands, the focus of the celebration was a maypole. A tall, straight tree was cut down (not a hawthorn, as it rarely grows straight) and hauled back to the village by a team of oxen. Stripped of most of its branches, it was erected on the village green and decked with ribbons in a practice that carried echoes of pagan rituals. This was the signal for dancing, singing, drinking and much mischief-making, and any householders who denied the revellers their favours were cursed with disease and poor crops in the coming year. Even the dewdrops that formed on hawthorn blossoms were precious. To enhance their beauty, women would bathe their face in dew collected from May trees, while men washed their hands in the water, believing that they would become more skilled at their craft. I’ve often wondered how, in the old days, people were able to find hawthorn in blossom on the first of May, because it seems far too early. And that’s because it is! It’s all down to the changeover from the Julian to the Gregorian calendar in 1752. In that year we were officially robbed of 11 days, and as a result the dates of all the festivals relative to the seasons jumped forward by the same amount of time. The old May Day would have been celebrated on or around 12th May in the new calendar. Do you remember your grandad saying this? If not, it’s likely that his own grandfather said it to him. What the heck is a clout? It is, in fact, the archaic singular of ‘clothes’. In other words, don’t shed any item of clothing until May is out! But whether your grandad was talking about the month of May being over, or the blossom coming out, is pretty much open to interpretation. ‘Here we go gathering nuts in May’ is a well-known line from an old song, but it really doesn’t make sense. Nuts in May? How much mead had they been drinking? But ‘nuts’ is apparently a corruption of ‘knots’, which refers to the knotted and entwined garlands of May flowers. When there’s light there also has to be darkness, and this is especially true for the hawthorn. After all, this is what Christ’s crown was made of. May blossom has a heady scent, but for people in medieval times it was a repellent stench, reminding them of rotting corpses during the ravages of the plague. In some countries, hawthorn was burned on a funeral pyre, in the belief that it would guide the dead safely into the afterlife. According to folklore, a hawthorn tree was the abode of fairies and stood at the threshold of the Otherworld. The rules were quite clear: anyone who cut down a fairy tree was doomed to perish. Although branches were gathered on May Day, they were never brought inside a house at any other time. And if you sat under a hawthorn tree, you were only asking for trouble. Thomas the Rhymer, a 13th century Scottish poet, is reputed to have encountered the Fairy Queen by a hawthorn bush from which a cuckoo was calling. He was led into the Otherworld for what seemed like a short time, but when he was allowed back into the land of mortals he found that he’d been away for seven years. If you are still in any doubt, take a look at the relics of our ancient past. Stone circles, burial chambers, wells and springs are often ‘guarded’ by a hawthorn tree, which may stand alone, wizened and weather-beaten, protecting the unseen spirits that remain. People would tie rags on a hawthorn that stood over a holy well, believing that the healing properties of the shrine would be absorbed by the cloth. Witches are said to ride on brooms of hawthorn, and wands made from this wood are believed to be especially powerful. A Welsh legend tells how Merlin was trapped inside a hawthorn tree by a witch called Nimue. Even where an old thorn tree has no obvious purpose, and may even be a hindrance to modern farming by standing defiantly in the middle of a field, local people will shy away from uprooting it. This is particularly true in Ireland, where the hawthorns were once known as ‘gentle bushes’ out of respect to their fairy inhabitants. I came across this delightful video from 1964 in the BBC’s archives, which shows an interviewer grappling in polite bafflement with some pearls of Irish wisdom. One story even claims that the failure of the Northern Irish car manufacturer De Lorean was brought about when a fairy thorn was dug up to make way for a new factory. This is a legend that never fails to beguile me. After Christ’s crucifixion, Joseph of Arimathea is said to have brought the Holy Grail to Britain, and at Wearyall Hill in Somerset he thrust his staff into the ground, whereupon it instantly took root. The resulting tree had divine properties, one of which was the ability to flower twice a year: at Christmas, and again in May. In the time of James I (James VI of Scotland), the Bishop of Bath and Wells began the tradition of sending a sprig of flowering hawthorn to the reigning monarch at Christmas, to adorn his or her festive table. The Glastonbury Thorn has suffered over the centuries, and it’s still struggling. Unbelievably, during the Civil War, Cromwell’s troops hacked down the original tree and burned it. Luckily, cuttings had been taken and a couple of ‘descendants’ survived. In more recent years, the surviving thorn has been further damaged by human hand, possibly by trophy collectors or vandals. In January 2013 a replacement tree, grafted from the old bush by botanists at Kew Gardens, was planted at Glastonbury. The name ‘hawthorn’ comes from the Anglo-Saxon ‘hagedorn’, meaning ‘hedge thorn’, which refers to its long-standing use as a hedging plant on field boundaries. It’s interesting to note that the word ‘hag’, meaning ‘witch’, shares the same origin, and at one time witches were thought to ride along hedges which were a visible line between this realm from the next. A hawthorn hedge therefore protected cattle and crops in both a physical and a spiritual sense. In the Ogham alphabet, the hawthorn or ‘huath’ represents the letter ‘H’, according to the theories of Robert Graves in his book ‘The White Goddess’. It governs the sixth lunar month of the Celtic calendar, which is from 13th May to 9th June. In Britain there are two native species of hawthorn: the Common hawthorn (Crataegus monogyna) and the Midland hawthorn (Crataegus laevigata). Hawthorn is deciduous and usually forms a compact shape, with small toothed leaves that are among the first to appear in spring. Pearl-like buds open into five-petalled flowers with a starburst of pink-tipped stamens at their heart. With its dense cover, hawthorn offers protection for a wide variety of nesting birds, and in autumn the berries are an important source of food. 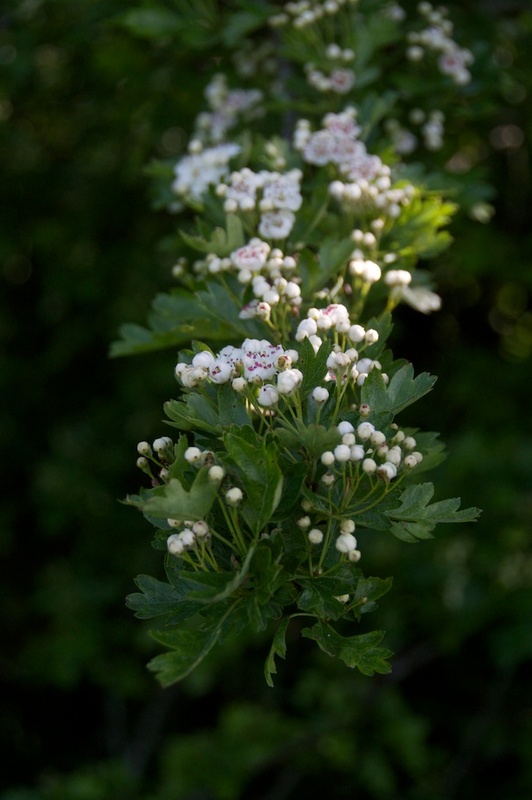 As an ingredient in herbal remedies, the flowers, leaves and berries of hawthorn have been used to lower blood pressure and to treat disorders of the heart, as well as migraine and insomnia. In spiritual healing, hawthorn is incorporated into some brands of essential oils to help bring peace and courage in times of emotional turmoil. It promotes love and marriage, fertility, prosperity, intuition, and happiness. In fact, it’s a lovely tree to have around! “Hawthorn trees have so many interesting, sinuous shapes, often accentuated by their use in many of our hedgerows, as the hedge is laid over the years and the different plants grow into and around each other. Fallen wood often displays strikingly beautiful patterns (‘spalting’) caused by fungus in the decaying timber. The trees take many years to grow into substantial trunks; the corded, muscle-and-tendon-like shapes often suggest their own sculptural form, and the wood can contain pockets of bark and twisted knots. This creates some very beautiful effects. Thanks to Justbod for kindly allowing me to include examples of his work. A beautiful and informative article. Thank you. As a child in London (with no Welsh connections) we called the leaves of hawthorn “bread and cheese”. Our previous house was called Les Aubépines, after the hawtorn hedge we planted, leaving a bush uncut every 5 metres to grow into a tree. The ones we left were the deep pink variety, which looked great surrounded by the sea of white. I look forward every year to the sight and scent of hawthorn bordering the local tracks and paths. Your article was – as ever – erudite and interesting. That’s very interesting, Viv. So I wonder where that name really originates from? What a great idea for the hedges around your old house! It must have looked beautiful. And of course, Aubépine = hawthorn (my Welsh is better than my French!) 🙂 Thank you so much for your lovely comment! Another great article Jo, and, thank you, of course, for featuring a wee bit about me and my work – very much appreciated! I love Hawthorn, on so many different levels. A truly beautiful and interesting tree which has obviously been very important for many years to our ancestors. I too remember it being referred to as “bread and cheese” – I think it’s because the young leaves are very edible and quite filling – which was probably quite useful in hard times! Thank you very much! 🙂 And you are most welcome. I can’t wait to see the hawthorn out around here, but it may be a few weeks yet, despite the warm weather. Yes, you’re right about the leaves of hawthorn – I think beech leaves were eaten at one time, too. Thank you, Lynne! Who is to say you don’t have fairies in your garden?! 😀 That’s very interesting about the thorn bush, as well! It seems those old beliefs are alive and well. Lovely photographs and lots of interesting information. I didn’t know that hedges were regarded as a visible line between this world and the next. I’ll be looking at hawthorn hedges differently from now on. 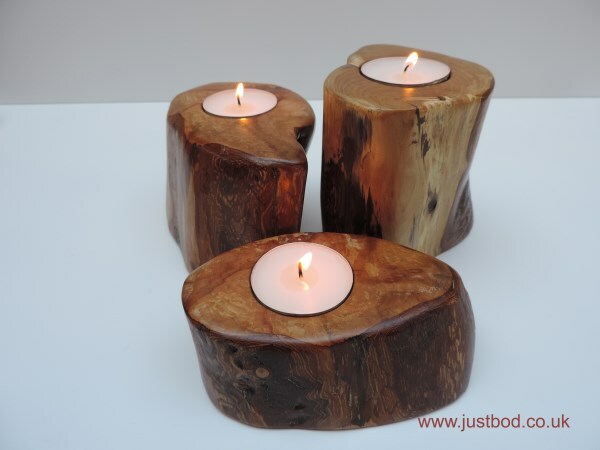 Justbod’s woodwork is beautiful. I found out a lot by writing this post, Lorna! There’s a whole world of half-lost folklore under our noses, it seems. 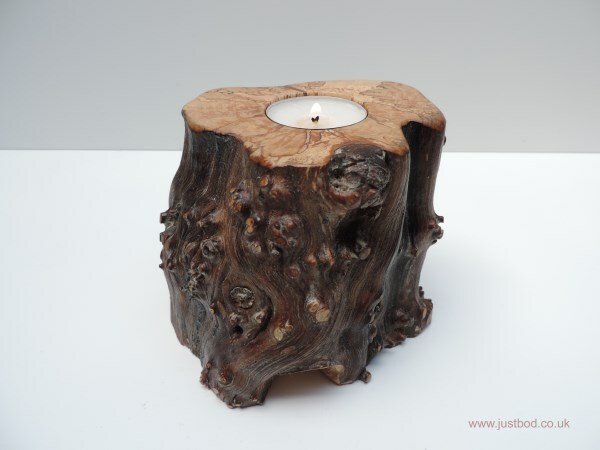 I found Justbod on Facebook and loved his work, as well as his posts about trees and the natural world.